Since 2005, after the Israeli pullout from Gaza, Hamas, with training from Iran and Hezbollah, has used the last three years to turn Gaza into a deadly maze of tunnels, booby traps and sophisticated roadside bombs. Weapons are hidden in mosques, schoolyards and civilian houses. Hamas as a terrorist organization constructed a vast military infrastructure in the Gaza Strip, including a large arsenal of rockets and mortar shells used to target the southern Israeli population. Already back from the outbreak of the second Intifada in 2000 and during the years 2001-2008 more than 8,000 rockets and mortar shell were fired into populated Israeli civilian areas). The terrorists’ military infrastructure was hidden in and around civilian homes and dispersed to locations scattered around the Gaza Strip, one of the most densely populated areas in the world. The dense population concentrations in the Gaza Strip are an easy arena for the terrorist organizations to fight in and use its population to leverage its terrorist agenda. The Gaza area is an unplanned diverse urban and rural area, which has been built up over a number of years in different styles, organized and disorganized, temporary and permanent, above and below ground. The continual changes in the urban environment have created layers of destruction and rebuilding, and there are branching underground constructions, which to a large degree trace historical urban development. This urban diverse layout is variant, which include mixed nighberhoods, dense refugee camps with narrow alleys, high tall buildings, small low huts surrounded with vegetations, green hoses and orchards, a fabric that needs operational preparatory planning and combat solutions and tactics for each type of generic urban design. Those areas, which include densely, built refugee camps, magnify the advantages of the defender over the attacker. The terrorist organizations aspire to use those advantages against the IDF in a fighting in the Gaza Strip. 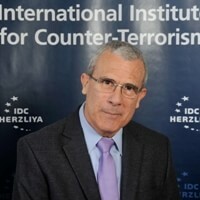 The calculated, cynical use of the civilian population as human shields is intended to decrease the vulnerability of Hamas and the other Palestinian terrorist organizations by affording them a kind of immunity from the IDF’s counterterrorism activities, since they are aware that Israel avoids harming the civilian population insofar as is possible. It is also intended to make it possible for Hamas and the other terrorist organizations to make political-propaganda gains in the battle for hearts and minds by representing Israel as operating against innocent civilians. The terrorist organizations’ doctrine of using human shields was inspired by Hezbollah’s tactics in Lebanon and by the lessons they learned from the terrorist campaign they have been waging against Israel since the outbreak of the second Intifada in October 2000. Hamas and the other terrorist organizations have approximately 20,000 arms bearing operatives in the Gaza Strip with varying degrees of skills. They have light arms, anti-tank weapons, powerful explosive devices, rockets and mortar shells. Their military infrastructure is situated within the urban population locations (with Gaza City serving as the nerve center) and eight densely populated refugee camps throughout the Gaza Strip. Hamas copied, adopted and developed Hezbollah’s the guerrilla style warfare doctrine, which is based on operating and exploiting the civilian population as human shields. They adopted it to the unique conditions of the Gaza arena, which are topographically easier than those in south Lebanon. Using civilians as human shields is a war crime, a grave breach of the laws of armed conflict and a crime against humanity. Rockets and mortar shells are routinely fired from built up, densely populated areas and near structures and facilities (including educational institutions and mosques) provided special protection by the Geneva Conventions. In the scenario of an IDF incursion into the Gaza Strip, the terrorist organizations will use those urban and refugee camp settings as the focal points from which they fight. The military infrastructure of the Palestinian terrorist organizations is situated in densely populated areas, and some of the facilities have been attacked by the IDF in Operation Cast Lead. Among them were headquarters, bases, offices, arsenals, tunnels, lathes and workshops for the manufacture of weapons, posts and bunkers. The various types of weapons in the terrorist organization arsenals (rockets, mortar shells, powerful explosive devices, materials for the manufacture of weapons) are usually stockpiled in stores within residential neighborhoods (among private houses and public institutions). The rationale behind doing that is to protect them from Israel attacks. Such weapons stores have occasionally been attacked by the IDF, resulting in civilian casualties. Some weapons are also stored in tunnels dug under residential neighborhoods, and sometimes in the homes of terrorist operatives. In some instances they may be the operatives’ personal weapons, but in other instances they possess weapons and ammunition to other operatives in times of tension. Hamas have constructed an extensive system of tunnels and underground networks in built-up urban settings to be used in combat against the IDF. They are intended to conceal operatives and weapons, allow for the movement of senior figures and operatives from place to place and for transferring weapons from one area to another. Tunnels were also built near the border security fence to infiltrate into Israel to carry out mass-casualty and abduction and other terrorist attacks. Many of the tunnels run under populated neighborhoods. The operators of the Gaza Strip tunnel industry often hide tunnel openings in civilian residences, and in one instance the IDF discovered an opening under a baby’s crib. Hamas has prepared in advance the urban settings intend to drag IDF ground forces into the urban areas and wage a stubborn urban guerilla style insurgency defensive battle from or near civilian residences, blending in with the population when necessary, placing IEDs next to buildings, in sewage pits and in other places. In addition Hamas made operational preparations to employ car bombs, dispatch suicide bombers (male and female) and fire low-trajectory shells. Similarly to other arenas of urban combat (Afghanistan, Iraq), Hamas’ defensive tactics were intentionally planned and intended to provide an asymmetrical response to the military and its technological superiority and to exploit the relative advantage of the Gaza urban terrain through the cynical and outlawed use of civilians. According to that strategy, Hamas and the other terrorist organizations view the population density of the Gaza Strip, both in the cities and the refugee camps, as focal points in their operational capabilities to wage an urban guerilla style combat against conventional military armed forces. The tactic of deliberately enlisting civilians as human shields to protect the houses of terrorist operatives has proved itself effective, in the eyes of the Palestinian terrorist organizations, at least until Operation Cast Lead. That was because of their awareness that the IDF does not deliberately attack civilians, even though the target is permissible according to the laws of armed combat. The human shield tactic improves their freedom of action, provides a kind of immunity, blending within the population, creating an inherent difficulty to be identified (“Friend or Foe”), enabling terrorist operatives wearing civil clothes to act mostly unidentified until they act and attack the ground forces. An example to how heavy populated civilian neighborhoods where used by Hamas as urban setting was revealed on 8 January 2008 by the Intelligence Corps Officer-in-Chief, presenting a sketch prepared by Hamas that details on the deployment of explosives and Hamas forces in the Al-Attara neighborhood in the northern Gaza Strip. The map was found during Paratrooper Brigade forces operating in Al Attatra village in the northern outskirts of Gaza, while soldiers moved from house to house by blowing holes through walls. The seized document was translated from Arabic and analyzed in a real time process and its operational data, insights and operational combat tactical implications were disseminated in a knowledge management real time process to neighboring forces. It describes, among other things, the location of explosive devices and firing positions in the middle of the civilian population in the dense neighborhood, which endanger the life of the civilians. The map shows that snipers were positioned at the entrance of the A-Tawil mosque and in the mosques next to it and describes the directions the snipers are aiming. It indicated that explosives were planted in the entrances of civilian homes. Hamas operatives were divided into three fighting areas throughout the neighborhood, colored blue, red and green. Throughout these area IEDs, (improvised explosive devices), barrel explosives, explosives, explosives against humans and anti tank explosives were planted. In addition to that, the map also showed an explosive device planted next to a gas station – the detonation of the device would significantly damage the surrounding area. Hamas booby-trapped the entrances of civilian houses with explosives put close to them; the objective is of course to hit IDF forces but a local explosion also could have severely damaged the houses of the civilians and cause great damage, and likely killing civilians. In one apartment building in Zeitoun, in northern Gaza, Hamas set an inventive, deadly trap. Hamas placed a mannequin in a hallway off the building’s main entrance, indented to draw fire from Israeli soldiers who might, through the blur of night vision goggles and split-second decisions, mistake the figure for a fighter. The mannequin was rigged to explode and bring down the building. The use of tunnels is known for a long period of time as a tactic within the urban warfare used by Hamas as an attempt to hit or kidnap soldiers. These findings point out to Hamas’s guerilla style development, notably their network of underground tunnels that IDF forces constantly uncover. Urban warfare is the most difficult battlefield, where Hamas and Islamic Jihad have a relative advantage, with local knowledge and prepared positions. Israeli Army has also come prepared for a battle both sides knew was inevitable. The asymmetric urban battle is waged among civilians and between enemies, who had long prepared for this fight, is now a slow, nasty business within the most difficult ground operation, the urban warfare. The most important strategic decision the Israelis have made so far, based on the lesson from the second Lebanon war, is to approach the incursion as a war, not a police style operation. Hamas is operating within a doctrinal framework, which the Israeli ground forces have to stitches to unpick, use surprise and unpredictable mode of operation to counterbalance.